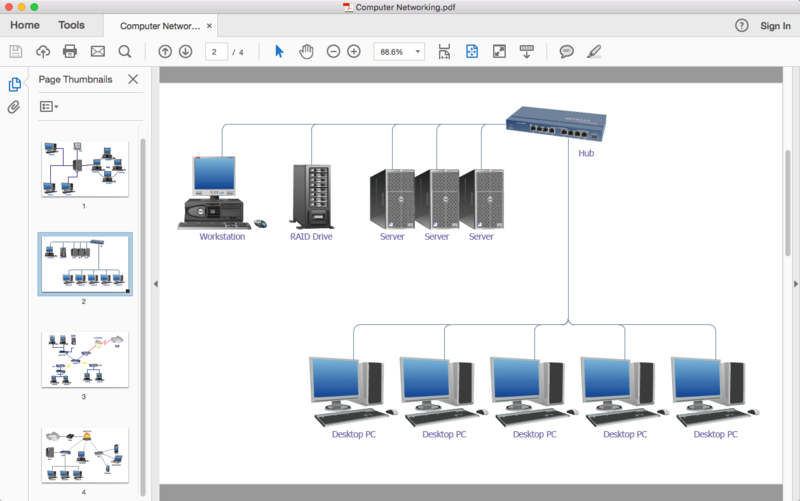 Making a Computer Network diagram involves many specific elements of Computer network topology that can be managed using ConceptDraw DIAGRAM. The ability to design Computer Network diagrams contains in the Computer Network Diagrams solution. Moreover, ConceptDraw DIAGRAM has export capabilities which allow you to export your drawing to Adobe PDF files. This allows you to easy transmit your network documentation between different computers with different operating systems and applications. Open any Computer Network diagram, created with ConceptDraw DIAGRAM. Go to the File menu, click Export, and select Adobe Acrobat PDF. Choose a location to save your file and click Save. Result: You can get clear network documentation pack and avoid any problems while communicating it with stakeholders. Easily draw charts and diagrams.